Sign up now to be entered to win a getaway where you can be a #trailsetter in Virginia&apos;s Blue Ridge. 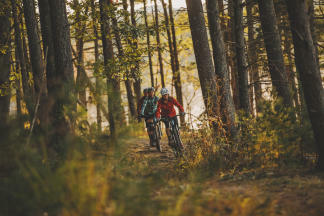 One lucky winner will be selected for a trip to experience the incredible fun of Virginia&apos;s Blue Ridge - America&apos;s East Coast Mountain Biking Capital! You&apos;ll get to explore the outdoors with awesome opportunities for hiking, biking & paddling, check out the arts & culture at local museums and attractions, and sample the flavors of the region with delicious food & craft beverages. There&apos;s a trail for everyone. Are you ready to create yours? The Grand Prize Winner of our Be a #Trailsetter Sweepstakes will receive this package. Fill out the form below to be entered to win! Yes, I want to sign up to receive the monthly e-newsletter about Virginia's Blue Ridge. Rules and Regulations: Entries must be received through the www.visitroanokeva.com contest sign-up page by 11:59 P.M. EST on August 13, 2019. One entry per person. One winner will be selected. Sweepstakes open only to legal residents of the 48 contiguous United States and the District of Columbia, who are 18 years of age or older. Void wherever prohibited by law. Families and employees of Visit Virginia's Blue Ridge and participating sponsors are not eligible. No liability is assumed for lost, late, incomplete, inaccurate, non-delivered or misdirected e-mail, garbled, mistranscribed, faulty, or incomplete telephone transmissions, incomplete or delayed computer transmission or any human error which may occur in the receipt of processing entries in this sweepstakes. By entering the sweepstakes, entrants agree Visit Virginia's Blue Ridge reserves the right, at their sole discretion, to disqualify any individual who tampers with the entry process and to cancel, terminate, modify, or suspend the sweepstakes. Winners agree Visit Virginia's Blue Ridge and participating sponsors, their subsidiaries, affiliates, agents and promotion agencies shall not be liable for injuries or losses of any kind resulting from acceptance of or use of prizes. No substitutions or redemption of cash, or transfer of prize permitted. Any taxes associated with winning any of the prizes will be paid by the winner. Winners agree to allow sponsors to use their name and pictures for purposes of promotion and for names & e-mail addresses to be shared with businesses included in the prize. Accommodations are based on availability and blackout dates do apply. Sponsors reserve the right to substitute a prize of equal or greater value. All Federal, State, and local laws and regulations apply. Selection of winner will be chosen at random at the Visit Virginia's Blue Ridge office on or around August 14, 2019. Winner will be contacted by the information they provided in the contest sign-up field and have 48 hours to claim their prize before another winner will be picked. Odds of winning will be determined by the total number of eligible entries received.